Analysts and sector experts pin this trend down to the aspirational nature of home and personal products. Viveat Susan Pinto reports. 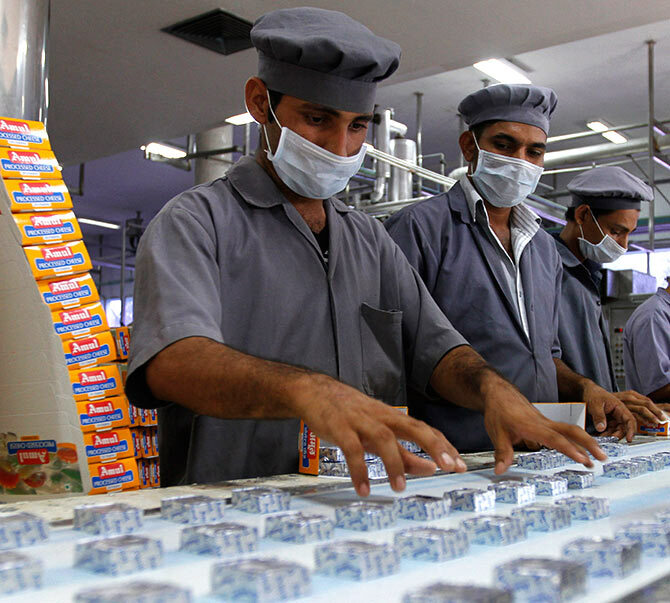 IMAGE: Inside an Amul processing unit. An expert says, "What MNCs have is globally-tested best practices and formulations that work well in home and personal care. Products are uniform across markets. In food, uniformity doesn't help. It is local tastes and preferences that work." India's nearly ₹3 lakh crore consumer goods market throws up an interesting trend. Multinational companies such as Hindustan Unilever (HUL), Procter & Gamble (P&G), Colgate-Palmolive and RB (formerly Reckitt Benckiser) dominate the home and personal care category here. Indian entities such as Gujarat Co-operative Milk Marketing Federation (GCMMF), marketer of the Amul brand of dairy products, biscuit maker Parle Products, Britannia and ITC dominate the food category. Analysts and sector experts pin this trend down to the aspirational nature of home and personal products, drawing Indian consumers to global brands. Food, on the other hand, is local in nature, they say, with Indian companies having a better handle on consumer preferences than their MNC rivals in this category. Arvind Singhal, chairman, Technopak, says, "What MNCs have is globally-tested best practices and formulations that work well in home and personal care. Products are uniform across markets. In food, uniformity doesn't help. It is local tastes and preferences that work, helping local food companies over their global rivals." A look at the 2015-16 top lines reported by food and home and personal care companies makes the picture. HUL, the country's largest consumer goods company, derived 77.3 per cent of its 2015-16 top line (₹31,987 crore) from home and personal care alone, its annual report for the period shows. Home and personal care includes soaps and detergents, which gave HUL 47.1 per cent of its 2015-16 top line, while personal products gave it 30.2 per cent of its top line. Packaged food, on the other hand, gave HUL only 6.6 per cent of its 2015-16 topline. Rival P&G, operating only in home and personal care, cumulatively derived ₹10,248 crore from its three companies in India in 2015-16. This included listed companies P&G Hygiene and Healthcare, P&G Home Products and Gillette India. P&G, for the record, has a July-June accounting period. British consumer goods maker RB, meanwhile, which is best known for its Dettol brand in India, reported a 2015-16 top line of ₹5,606 crore, while Colgate-Palmolive, the country's largest oral care company, reported a 2015-16 top line of ₹4,162 crore. In food, GCMMF, whose Amul brand is among India's most popular food products, tops the list with a turnover of ₹23,004 crore for 2015-16, while Parle Products has an 2015-16 turnover of ₹9,500 crore, according to industry estimates. Britannia's 2015-16 top line is ₹8,607 crore and ITC Foods’ 2015-16 top line, according to analysts estimates, is ₹7,779 crore, which is 80 per cent of its total turnover from its consumer business minus cigarettes. Abneesh Roy, senior vice-president at brokerage house Edelweiss, says, "Companies such as HUL have limited exposure currently to (packaged) foods. This explains why its turnover from food is small vis-à-vis home and personal care. "Secondly, local companies have dedicated supply chains like ITC’s e-choupal, helping them in the food category. "Thirdly, global giants have traditionally been strong in home and personal care in India because they come from markets where products are evolved. Their product formulations are better, giving them the edge here." While some experts believe that the growing herbal/ayurvedic trend could upset the apple cart for MNCs in home and personal care, others say this is a long way off. "Though usage of herbal/ayurvedic products has been growing in the country thanks to proponents such as Patanjali, MNC consumer goods companies have been quick to respond to the trend," G Chokkalingam, founder, Equinomics Research & Advisory, says. HUL itself has revived its Ayush brand recently to counter Patanjali and is now introducing herbal variants of key brands such as Fair & Lovely in skin creams. Most other majors, including Colgate-Palmolive, are also increasing their emphasis on herbal variants in toothpastes. Is Patanjali set to change the face of FMCG in India? Will you buy a Made in India product? Is FMCG growth story tapering?